Potash Development Association (PDA) is an independent organisation, formed in 1984, to provide technical information and advice in the UK and Ireland. It is supported by Cleveland Potash Ltd and Tessenderlo Group who supply the fertiliser market with potash products. 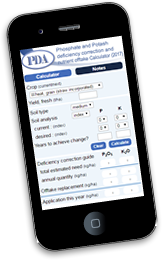 The aim of PDA is to improve the understanding of potash in soils and plant nutrition, so that the amount used, and the timings of the applications, are correct for the crops and grass being grown. To achieve this, we produce a series of free advisory leaflets, newsletters, and this website. We provide training via meetings and conferences. Also we support research and liaise with other organisations and Government. In particular we support the activities of advisors and the farm managers who are responsible for correct fertiliser practice on farms. We believe that improving the way potash is used on farms is a useful contribution to the success of the agricultural industry.